I see in the latest Hana Hou, Michael Shapiro took the left turn off Mamalahoa Highway on the Big Island, and “went down Milolii”. This hard scrabble community, which many bill as “the last traditional fishing village in Hawaii,” really is a piece of the past. For example, there’s no electricity. That, as Shapiro notes, is largely by choice–the village elders trying vainly to hold onto their heritage. But, once you make the trek down Milolii Road to the seaside, it’s pretty clear you’re far away from anywhere else. 220 volts wouldn’t change that. Shapiro made the trip, it seems, to check out the Milolii Lawaia Ohana Camp, a sort of summer camp intended to help sustain traditional fishing practices. This year, more than fifty kids and their families attended. It’s a big celebration for a community that practically exists because of traditional fishing. Missing from Shapiro’s piece is a detail that makes remote Milolii part of a vast and growing world community. In 2006, the Hawaii State Legislature approved a bill that made the waters off this scruffy fishing village one of the first Marine Managed Areas in the state. Since then, the community has been working with nonprofit groups, like the Community Conservation Network (now, the Hawaii Community Stewardship Network) and the community’s own Paa Pono Milolii, to draft the rules and principles for a community managed marine area–one in which near shore marine resources are protected through traditional management techniques. Milolii is just one of nearly two dozen Hawaii communities, on all the major islands, that are trying to bring marine conservation to a local level. For mostly Native Hawaiian communities, like Milolii, fishing and access to fish is a key part of sustaining traditional culture. But this isn’t just a local issue. Community-base marine protected areas are now scattered across the Pacific. This controversial model of conservation is intended to revive and sustain reef fisheries by establishing no-take zones where fish populations can recover from the pressure of over-fishing. They take many forms. One vision of the Milolii community managed marine area would require all fishermen within its bounds to use traditional fishing techniques. 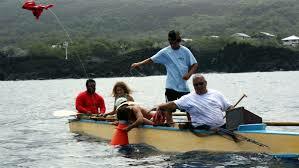 That would mean fishing for opelu, the main fishery for the village, from wooden outrigger canoes, which would essentially mean only locals could fish there–sport fishermen in their big fiberglass boats with powerful outboards would be banned. Other communities use different strategies: complete take-free zones, seasonal fishing restrictions, community member fishing only etc. As remote coastal communities in the Pacific compete for fewer and fewer fish, these types of arrangements will likely become even more common. Just along the Kona Coast of the Big Island, Milolii, Honokaa and Honaunau all are seeking some kind of community control of their near shore marine resources. And if traditional fishermen in other communities want have a nearshore fishery in the future, they’ll be trying to do the same thing soon.